Hi, we are Ms.BUNNY, a café where you can hangout with our hedgehogs while enjoying the drink of your choice. We are offering opportunities to play with our hedgehogs by drinking, which is really unique. Hope you have fun and get relaxed through our cafe. We went to the Harajuku location on a Sunday afternoon, after checking out Meiji Temple and Yoyogi Park. 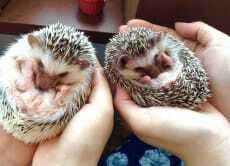 The hedgehogs spend most of their time sleeping unless you feed them. They are nocturnal. My wife spent the whole 30 minutes holding them. To be honest, I was done after about 5 minutes, so 30 minutes is plenty. There is a sign on the wall that asks you not to eat them, because they are so cute. I felt the process was very organized and we had paid for just 30 minutes which i thought might be too quick but we ended up finishing within 20 minutes. The staff does a great job at explaining how to handle the hedgehogs and you/your party gets their own set of hedgehogs to play with so you don’t have to wait for people in order to take picturess. Hedgehogs were very cute and we were able to skip a 30 minute wait with the tickets. Recommended.